For this review, I spoke with Mike Everett, Vice President of Business Development and Charlie Haims, VP of Marketing. Everett joined the firm back in 2010 after 14 years at Checkfree (now Fiserv Investment Services). Haims has been with MyVest for almost a year and a half and was previously in the same role at SharesPost. 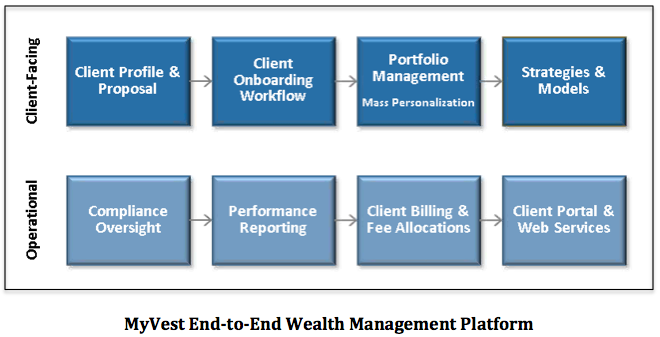 The MyVest platform was designed to provide all possible wealth management services as one system, Everett explained. It is not a set of disparate products that have been cobbled together. It uses a single, robust data model that is highly efficient and avoids data synchronization issues that other separately integrated platforms experience, he said. This powers a role-based system enabling firm-wide collaboration on the same set of client records in real-time. It provides a true end-to-end workflow from proposal through portfolio management to reporting and billing, Haims claimed. The single, unified system approach has other advantages as well, Everett continued. It is easier to implement code changes to support new features and services, such as householding. Other vendors, with platforms created by stitching together multiple products often have to deal with separate code bases and data models. MyVest has only one of each, reducing the time and effort of enhancements and ongoing maintenance, he claimed. Another differentiator is MyVest’s notification system, Everett reported. Their monitoring system and rebalancer, which evaluates all portfolios on a nightly basis and compares them against their target strategy, can send notifications to different people based on their assigned roles in the firm, he noted. For example, trading or portfolio management staff can manage by exception and work with those portfolios that requiring attention rather than reviewing report after report to identify accounts that might require attention. According to Everett, using automated rebalancing software automates the time-consuming daily process of ongoing monitoring of investment solutions. Since automated rebalancing can be can implemented quickly and effectively using a system like MyVest’s, it frees up the advisor to focus on more value-added tasks, which helps maximize the value of the company, he stated. Also, automated rebalancing enforces the use of portfolio management best practices across all clients, whether they are large or small, he pointed out. One of MyVest’s clients leverages the scalable portfolio construction functionality of their platform to manage over 2,700 strategies, Everett declared. Their system allows a home office to create hierarchical models of models and distribute them automatically, which provide tremendous efficiency when managing a large number of strategies, he said. They have built a set of web services that can be used to access their platform’s core functionality, Everett explained. Currently, these interfaces are only being used by clients. In the future, they could also be offered to third party vendors for external integration, he ventured. Everett pointed out that MyVest also distributes their portfolio rebalancer software through a number of channel partners such as Scivantage, who has integrated it into their Scivantage Professional™ Financial Advisor Workstation. This is similar to how Pershing uses software from FolioDynamix for their Block Trading and Rebalancing feature in NetX360. The price for the SPS platform depends numerous different factors and is usually different for each client, Everett said. Yes, the rebalancer in the SPS platform brings in the latest prices before analyzing the portfolios during a rebalance, Everett maintained. No, the MyVest platform provides implementation services only. it doesn’t offer any investment analysis tools or due diligence, Everett answered. SPS does not support short positions, according to Everett. They have never had much demand from clients for this functionality, he noted. The average implementation time for the SPS platform varies, depending on the specific solution that was purchased. it can also vary depending when using on of the channel partners, he stated. MyVest doesn’t make any judgements in this area, Everett announced. They leave it totally up to the advisor’s discretion, he said. Yes, and there is no technical limit to the number of levels that can be created within a model hierarchy, Everett observed. One of MyVest’s goals is to create a deep relationship with their clients, Everett emphasized, so they provide unlimited technical support after implementation. The license agreements for SPS or the Model & Rebalance tool all including unlimited ongoing support, he said. 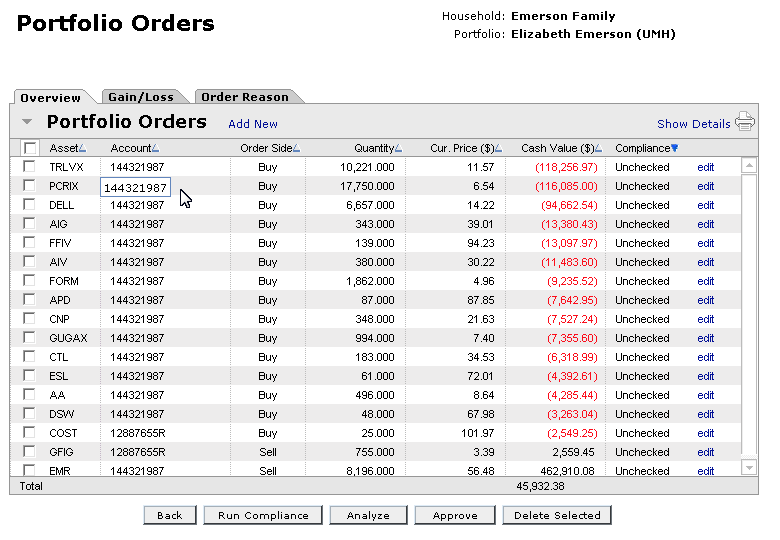 One feature that advisors really like is when they are building new or editing existing strategies, they can drill down into an SMA and view the underlying holdings, Everett offered. This allows them get a better feel for how the manager is implementing his or her strategy, he noted. Another useful feature is the results displayed by the rebalancer that shows the user the savings generated by the tax-optimization module, Everett continued. 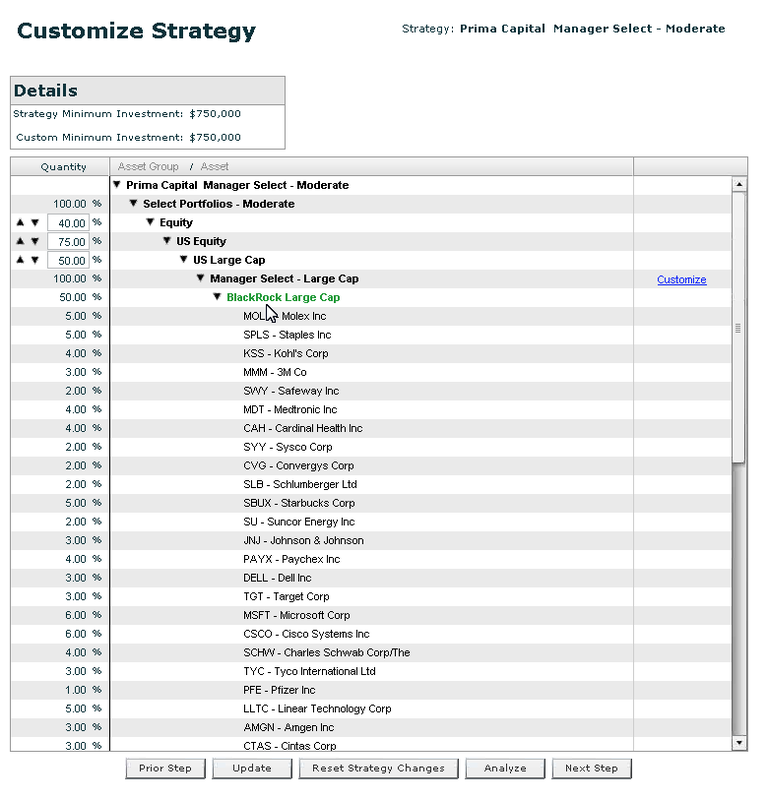 It displays two columns, one that shows the net capital gains generated by the standard rebalancer, those that were proposed by the tax optimization. You can clearly see the difference and amount of taxes that are being saved for the client, he said. MyVest has a number of exciting new features that are currently in QA, Everett informed me, and will be included in a new release planned for sometime this summer. This includes a new trade blotter that allows users to create block orders and route them to different destinations, he said. Their advisor-directed models functionality will be enhanced to support characteristics-based fixed income modeling so that advisors can build their own bond ladders for clients. The bond characteristics will flow through the trade blotter so that traders can buy bonds that match the client’s requirements. Also, the new release will include a cross reference trading tool, which will enable advisors to set target weights for a specific security across all portfolios and the system will generate the necessary trades, Everett explained. This feature is for Rep as PM advisors who haven’t really embraced models yet, since they want to exert more control over the portfolios. he stated.